HOPE is our children’s window for a better tomorrow. In terms of resilience and well-being, hope is a critically important predictor of success. 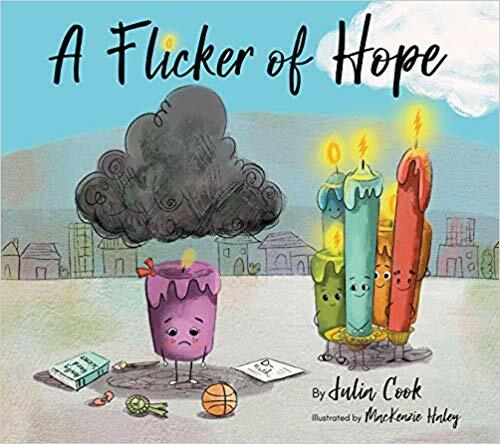 This story reminds children that dark clouds can be temporary and asking for help is always okay. We all have times when we need to borrow a little hope from someone else. Reach out and ask, Can I borrow some light? I’m having a really bad day. I just can’t do it today. Sometimes the dark clouds overhead seem too heavy and you feel like giving up. Little candle knows all about this. Bad grades, blasted on social media, worried about making the team, and wondering who her real friends are so many hard things to deal with! All she can see is darkness. But her story begins to change when someone notices she needs a boost of hope. As little candle is reminded she has purpose and her own unique gifts, and that she isn’t the only one with dark clouds, her dim light begins to shine brighter.